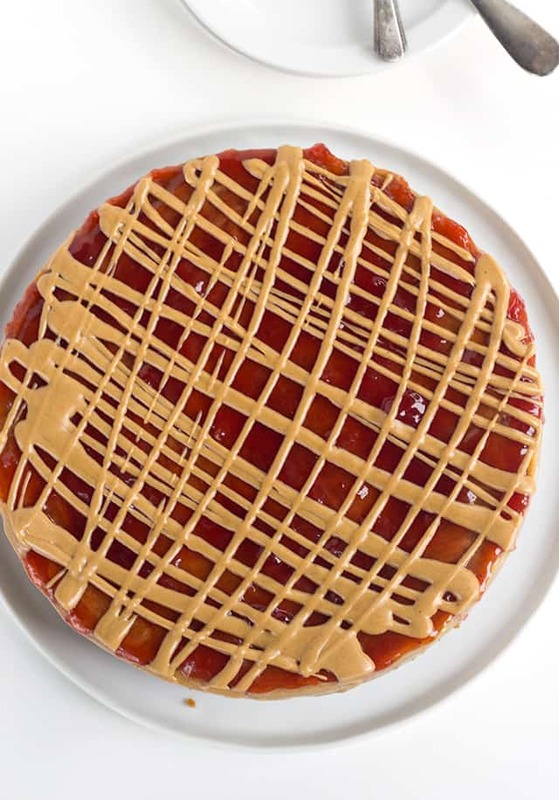 This peanut butter and jelly cheesecake is rich and creamy! There are pockets of strawberry jam inside the cheesecake, so when you cut into it, jam comes slowly oozing out. 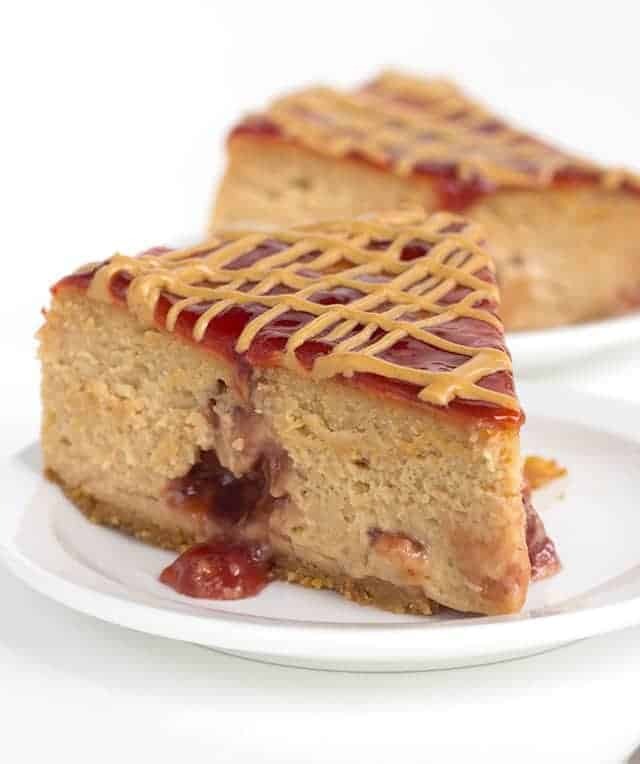 My favorite part of this cheesecake is the peanut butter and jelly topping. It’s fun and quite pretty! This is a sponsored conversation written by me on behalf of Dean’s DairyPure® Sour Cream. The opinions and text are all mine. This cheesecake is my perfect dessert. 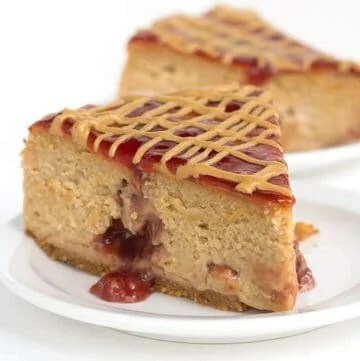 It’s a cheesecake (one of my favorite desserts ever) and it’s made of peanut butter and jelly. Hello, nostalgia! These two things were meant to be together. I know you’ll agree, especially after you try it. 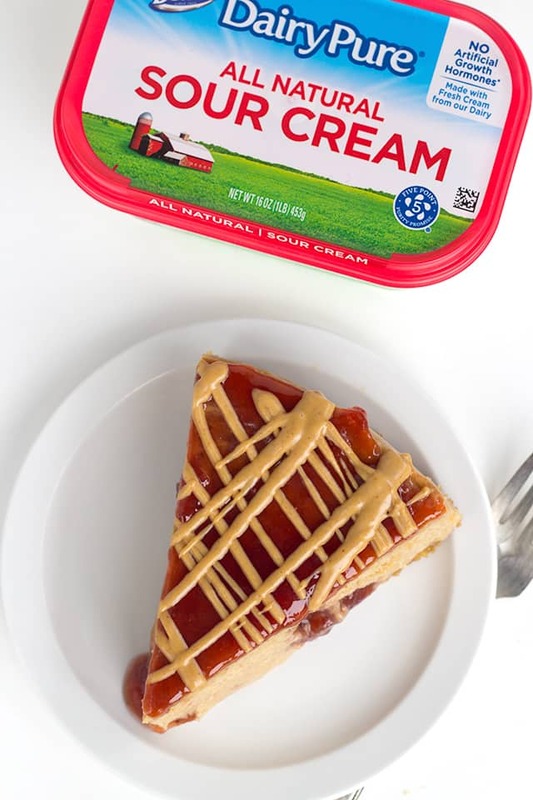 I’ve been on quite the peanut butter and jelly kick as of lately, so when I decided to create a dessert with Dean’s DairyPure® Sour Cream I immediately thought PB and J. I started with a peanut butter cheesecake. It has a BIG punch of peanut butter flavor and is rich and creamy. I added a hefty amount of peanut butter because nothing is worse than a bland peanut butter dessert. Then I piped pockets of strawberry jam throughout the cheesecake batter. 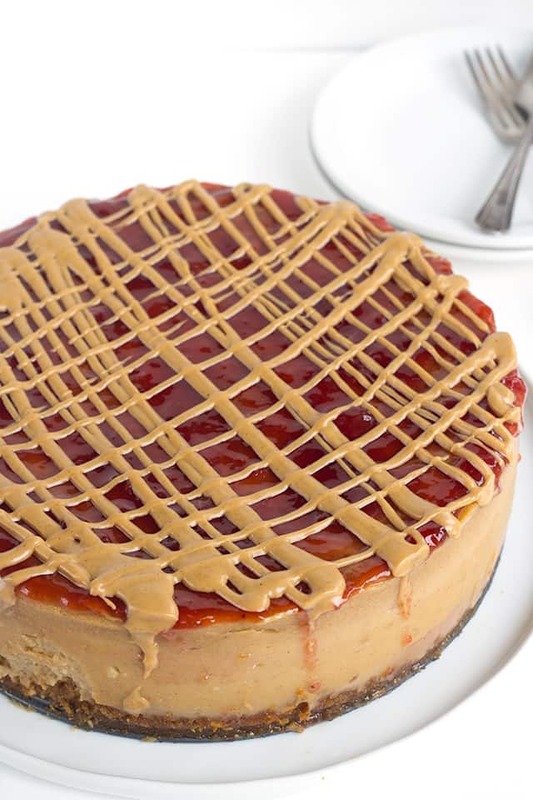 Since the cheesecake is dense, it doesn’t allow the jam to ooze all over and create a huge mess within the cheesecake. If you don’t like strawberry jam, use your preferred kind. I haven’t tried using homemade jams in this recipe, but any store-bought should work well. Can you see the brown top peeking through the jam? This cheesecake took an exceptionally long time to bake. The top of the cheesecake browned up before it was ever done baking and that’s okay. You’ll see that nice browned top in the video. I needed something a little more appealing for the photos though. I think I pulled it off too. Whew! Can we talk about this sour cream for a minute? It tastes so fresh! It’s the sour cream you want to use when you’re adding it to the top of a baked potato. Deans DairyPure® has an exclusive 5-point promise on all of their products including the sour cream and heavy cream! That means there are no artificial growth hormones, the milk is tested for antibiotics and continually quality tested, the milk comes from local cows with a healthy diet, and lastly, the products are cold-shipped to your local store. By the way, I found my sour cream at the Dollar General. Click over and get a coupon to save some money before you pick up your sour cream. In a mixing bowl, add the graham cracker crumbs, peanuts, sugar and melted butter. Stir until the butter coats all the crumbs. Press the crumbs into a 9.5 inch spring form pan. Press the crumbs on the bottom of the pan. Place in the oven and let bake for 15 minutes. Remove from the oven and let cool. In a large mixing bowl, add in the cream cheese and peanut butter. Mix until creamy. Add the granulated sugar and brown sugar in with the cream cheese and peanut butter. Mix until completely incorporated. Scrape the sides and bottom of the bowl and mix again to avoid any lumps of cream cheese in your batter. Add in the eggs one at a time. Mix each egg completely before adding the next. Also scrape down the bowl after adding each egg. Add in the sour cream and heavy cream. Mix until incorporated. Just before adding the cheesecake mixture, line the outside of the spring form pan with heavy duty tin foil. I double wrap it to prevent the water from leaking in. Pour the cheesecake filling into the cooled crust. Add the strawberry jam into a disposable piping bag. Cut a hole in the tip big enough to push bits of strawberry through it. Push the piping bag into the cheesecake batter and squeeze jam into the cheesecake. Repeat until the jam is all piped into the cheesecake. Place the springform pan in a slightly larger baking pan. Fill the outer pan with water. Fill it so it at least goes a quarter of the way up the springform pan. This will keep the cheesecake from cracking. Place in the oven at 325 degrees and let bake for 1 hour 45 minutes to 2 hours or until done. The top of the cheesecake will be brown. To make sure the cheesecake is done, give it a wiggle. If it slightly jiggles in JUST the middle like jello, then it's done. If it jiggles all over, it needs to bake longer. Turn off the heat and crack the oven door slightly. Let it cool in the oven for an hour or two. I kept mine in the oven for about 2 and half hours and then placed it in the fridge. Add the jam into a small mixing bowl. Stir the jam until it loosens up and will easily spread. Spread the jam on top of the cheesecake. Add the peanut butter into a small microwave-safe bowl. Microwave for 15 seconds and stir. This will thin the peanut butter out. Add the peanut butter into a disposable piping bag/sandwich bag. Cut a small hole into the piping bag/sandwich bag. 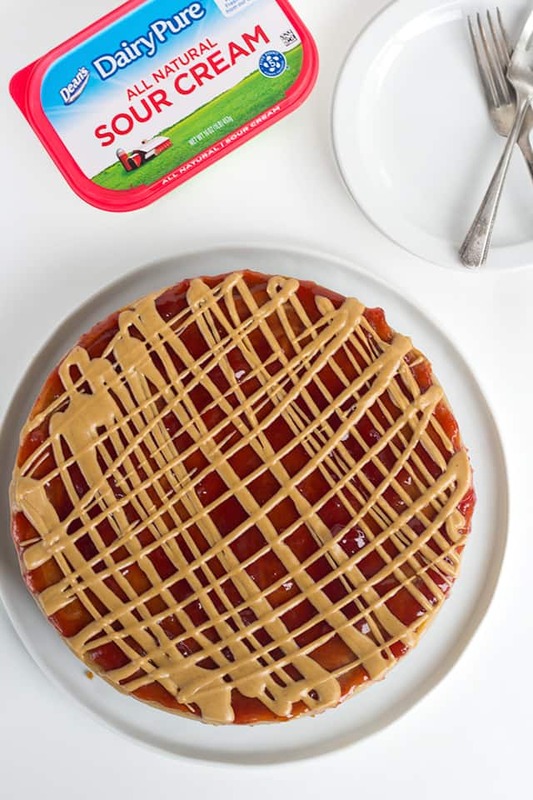 Drizzle the peanut butter on top of the strawberry jam.